My first major modelling since the start of operations has been under way. I have decided to add and interior to a freight station. Nothing major planned, more of experiment and learn. Here are photos of the work area and the rafter jig. The jig for rafters, floors, studs. I haven't been doing much actual building, but I have painted all the Woodland Scenics "Flag Stop" buildings. I just need to assemble them. 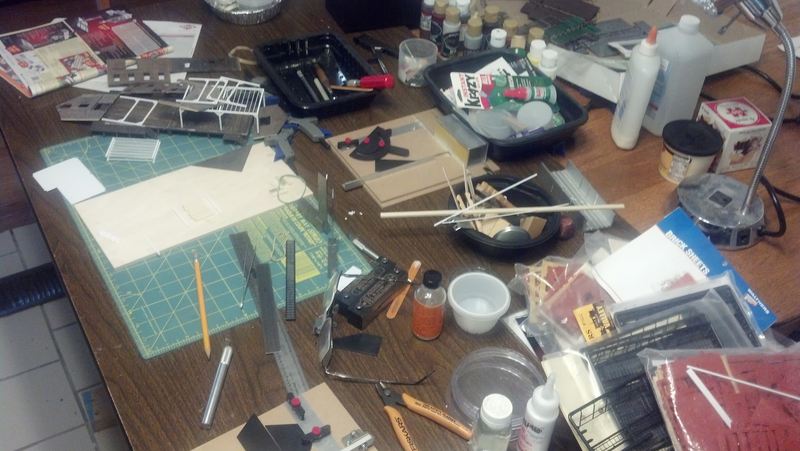 I have the large station on a table ready for assembly. I need to figure out yet what I want to do for the flooring and the walls in the main hall. For the tower, I plan to create some kind of metal/beam structure to hide the corners. Now that I got modules H-K reinstalled and bolted together, I hope to get the engine service track finished. Then I want to get the coal and feed building built and painted. 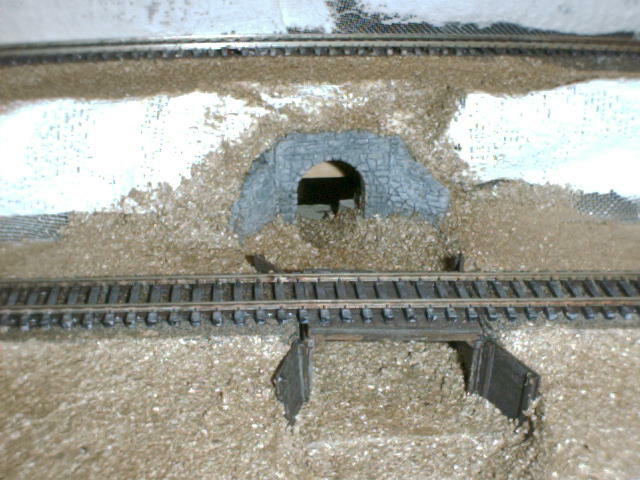 I also hope to get some ground forming done so I can place some of the completed structures on the layout. 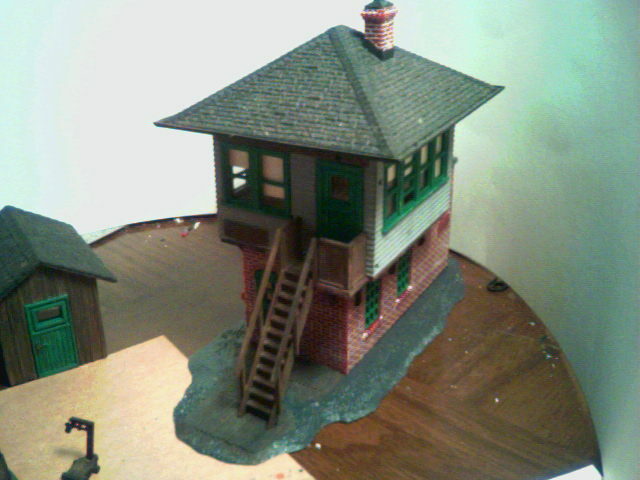 Slow modelling over the winter months, All the stations walls are completed, however, I put it away for awhile. I was stuck on how I wanted to finish the interior. I always try to do someting with the interior of the buildings, at a minimum, just painting the inner walls on the small shanties, construction paper for view blocks and such. As I don't intend to use interior lights, I do try to give the buildings some substance. 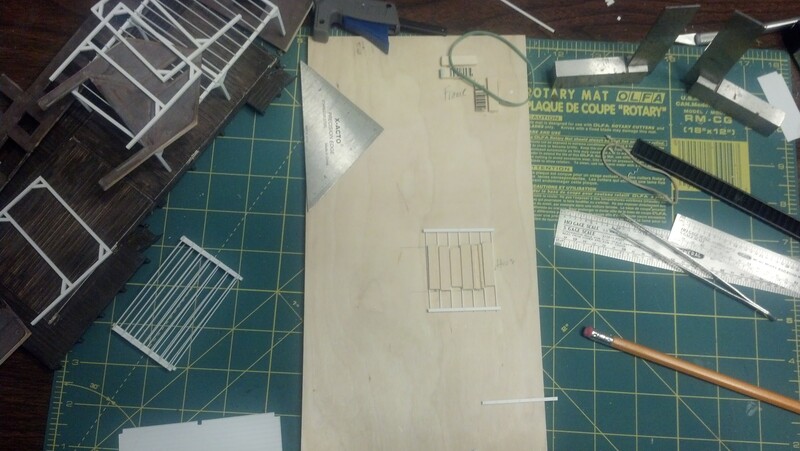 For the signal towers, I use brown construction paper and pencil in the planks. At some future time, once the layout is operational and I have the majority of cars, I may go back and add some interiors. In the case of the station I did want to do something a bit more, so for the tower I scanned the walls and printed them out in color. Cut out the windows and I have a visually appealing interior. But I haven't figured out how I want to construct the stairwell or how to do the station interior. So it went back into the box. From my C and O HS magzine, I saw a picture of a bridge switcher. It is a 0-4-4 and since I had a few broken Bachmann 4-4-0 lying around, I have taken one to hacksaw/dremel. Slow going, but it is progressing. Pictures once I get it to a recognizable state. Watching some trolley videos on TV, gave me the idea to take an Overton passenger car and convert it to a trolley. I couldn't figure what else to use it for. I like how it is progressing. I have just painted a bobber caboose in the railroad colors, I added a simple construction paper viewblocks inside. The shanties are finished as well as (nearly) two water towers. 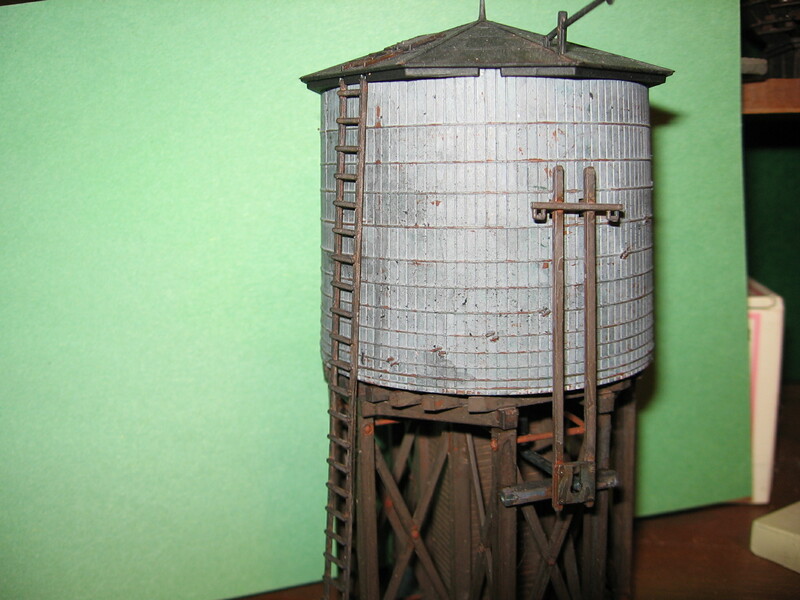 The water towers still need the water level indications attached. Two switch towers are painted waiting assembly. I have finished painting the Atlas passenger platforms (4), I might use these at the Loweel station. I finally got the pictures loaded, now I can promise more pictures real soon! Quite a few decisions have been made; I found a replacement for the coal yard building - Rix Products Board and Batten Building #2. Yea, I changed my mind on wanting brick. This two-story building allows me to invert one side and provide a second story hay loft door. 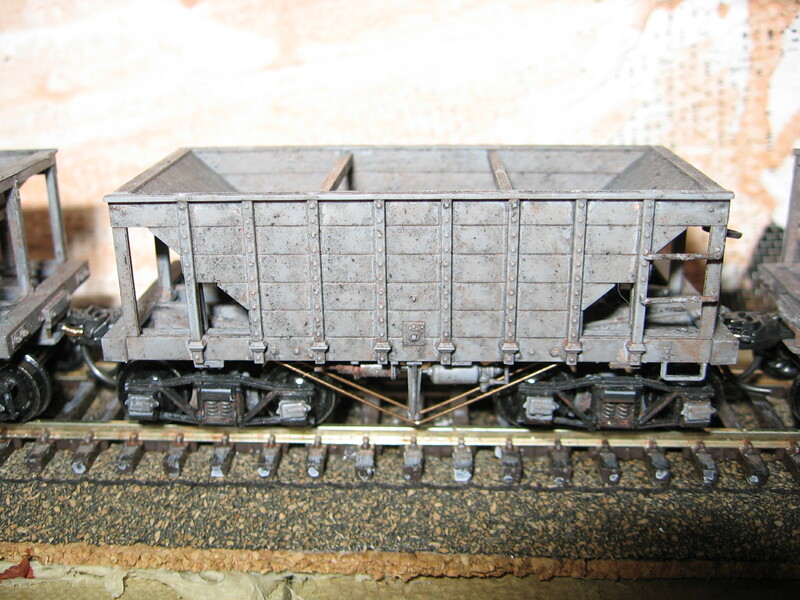 This allows a stock car to deliver hay on the coal siding. Some operational interest and a reason to buy stock cars. I have a few projects in the painting process (everyting gets painted before being put on the layout!) The "old-time conveyors" have been assembled and look good. Even though I haven't decided on the final color for any rolling stock, the railroad colors are brown, grey and green. 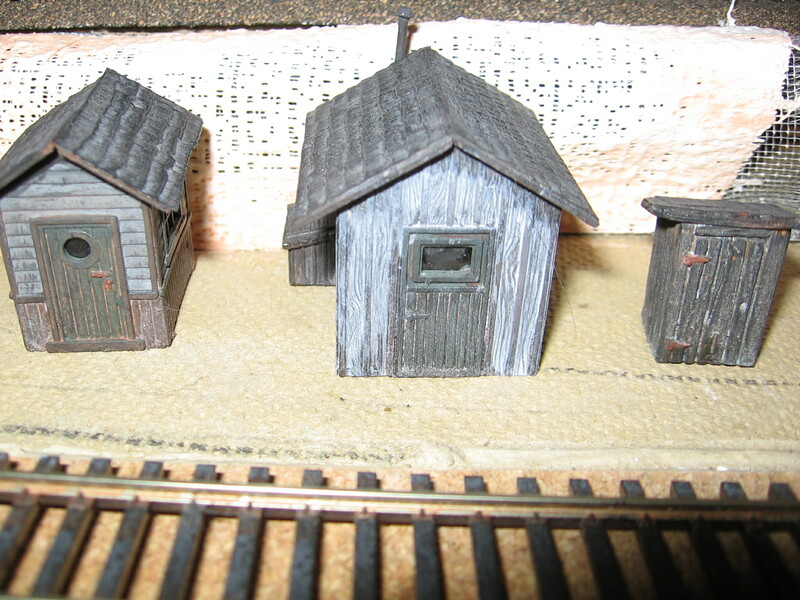 And I have four Woodland Scenics "Flag Stop" buildings in process. I added cross members to the windows that create 8 panes from the current 4. It is a tedious project, but really looks good. Pictures real soon! Well, I finished the coal yard building, but found out that it won't fit the intended spot. When I laid the track, even though I had blocked out the location of the building, I moved things around for alignment. Now I find that I do not have the clearance for the building. Oh well, remeasure, and find something that works. I wanted to stay with a two-story brick building, plastic since I do not have any experience with craftman kits. Walthers has a Don's Shoe Store kit that would fit. A short discussion on the Yahoo ldsig group, gave the suggestion of placing a lean-to with a some wood on the ground for the scale. I thought, why not make the ground floor also do double duty as a stable for the coal operations. A couple of stalls, with horses, a wagon parked inside, maybe add a small tool shop-blacksmith building off the back. 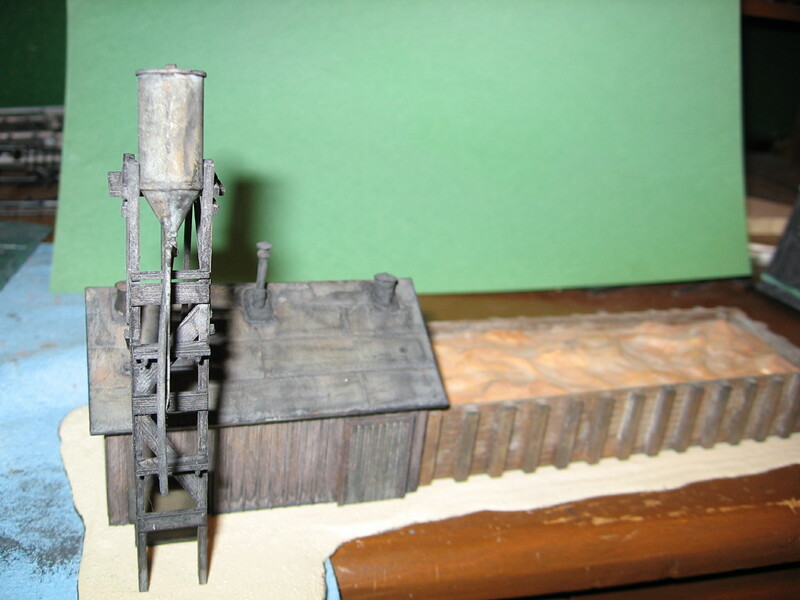 I also have finally built the small coaling station Pola kit. This will be for the helper enginehouse. I still need to build an ashpit and find a small building to use as sand house for this kit. Pictures will be coming! I hope to have some photos added real soon now! The coal yard building is nearly finished. Also, the coal loader for the single enginehouse on Module F is being built. I have decided on a bright grey for the coal yard building windows. I have also cut colored construction paper for the interior walls and floors. Of course, everything will get washes of black. I have received the station kit I plan to use for the two story Loweel station. 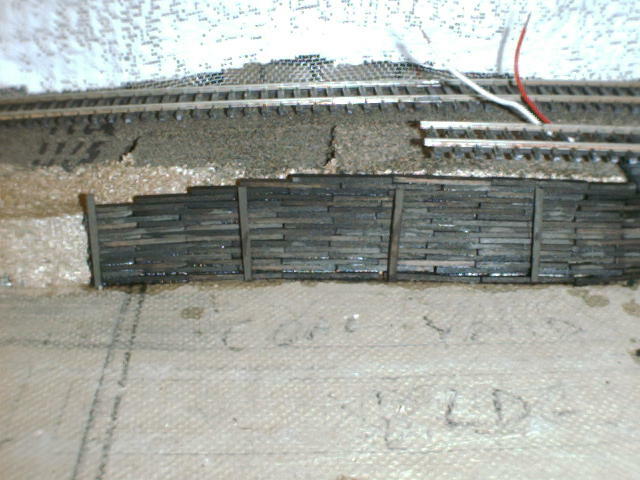 I figure I can cut the track side wall in half, which allows me to have the normal platform and doors at the mainline level. The other half has possibilities as a half-below grade level to mitigate the gap between the branchline track and the first floor door. A complication is that I will need to cut a section from each first floor side to account for the platform wrap. I am still trying to find a solution for the mainline bridge over Skina Pond. 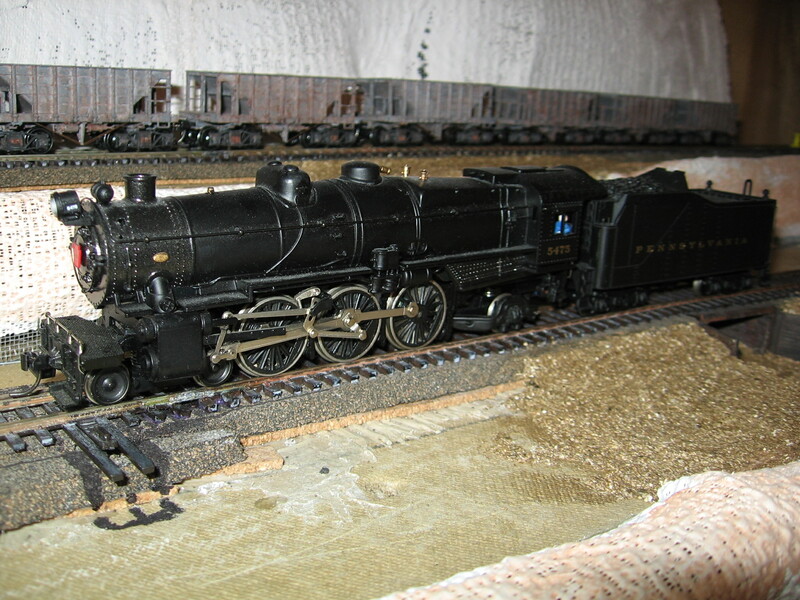 I have a Walthers double track bridge, but it overpowers the location. I think a support system below track level is needed. Also I plan to use a planking effect above the ties, I had seen a period picture with this effect. 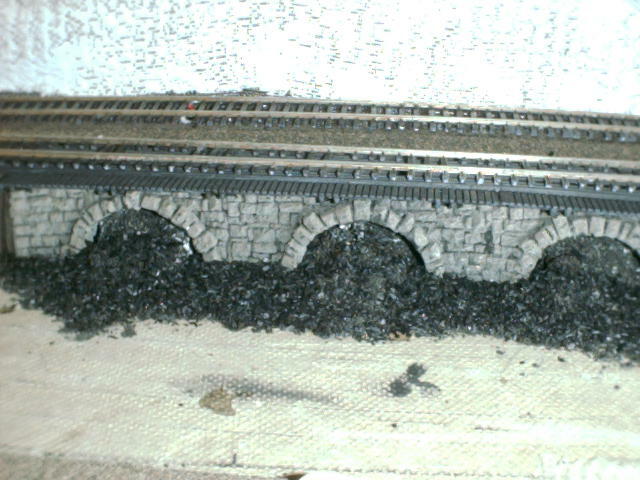 For the bridge over Module D, I plan to use the Noch arches. I hope this allows wagon access through the arches to the team track, off the branchline station spur. The second set of Tichy ore cars are nearly complete, just the brake staffs need to painted and installed. I have finally decided that the cars should be black with white lettering. The second engine decoder install has started on the IHC 2-6-0. I now have all the supplies available. The Kadee couplers require a bit of machining around the front pilot. For the industry located on Module I, I think it will be a manufacturer of spirits. This will allow deliveries of wood and grain, shipments of barrels. I plan on using a two stall enginehouse (missing a wall), cut down the middle. The open middle will be at the layout edge with a detailed loading dock visible. This should be one of the more ambitious projects. I have finally started to glue together the next twelve Tichy ore cars. I figure I'll need another 3 dozen(3 sets) to support the planned coal operations. Here is a presentation of my modelling efforts. I have three engines, boxes of passenger cars, 12 built Tichy Ore cars and 12 unbuilt but painted. I am currently searching for caboose ideas. I may try my hand at kitbashing something with a Tichy Ore car frame? 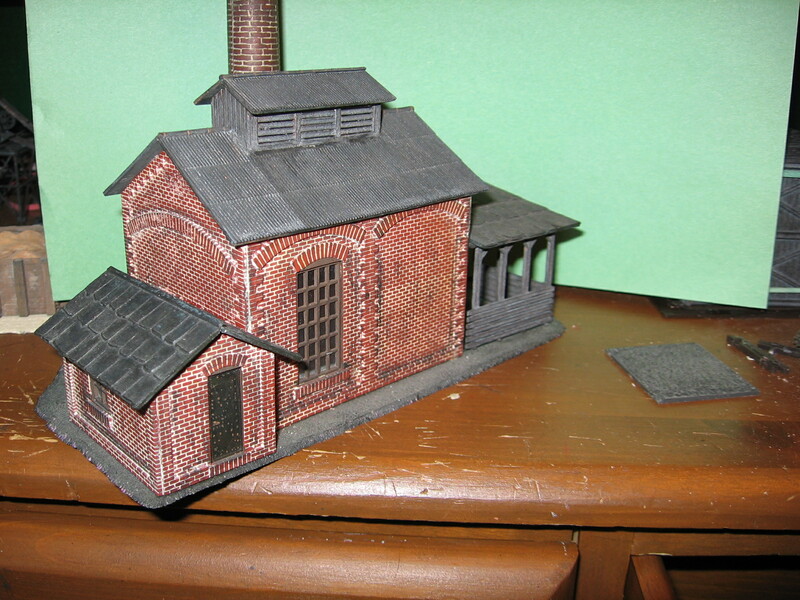 The enginehouse has been ready to go for years, however I am now adding some brick paper I had to the inside. I hope this removes the looks like a toy effect when the doors are open. The powerhouse and sand house have suffered "earthquake" damage from being moved too often. 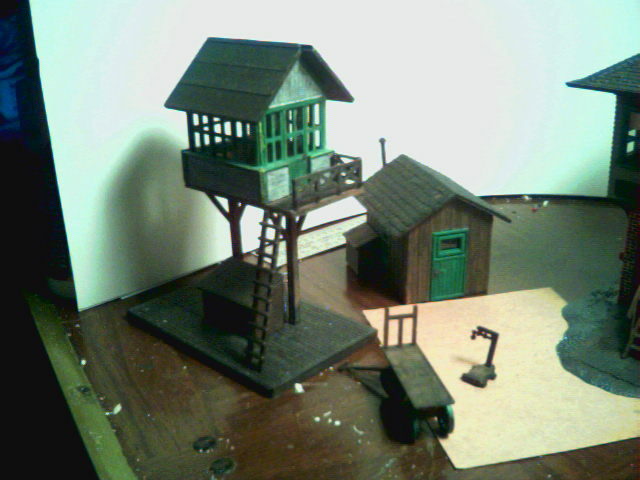 I have finished painting a water tower, freight house, watch tower, and section house. I am currently painting the coal yard building.